The following meditations on the mysteries of the rosary were written by Rev. Emmanuel Charles McCarthy. In the Mystery of the Annunciation three “Yes”es are necessary. Each “Yes” has to be spoken in the context of a potentially horrific future. Joseph must say “Yes” to that which his reason and nurturing would insist he say, “No.” From his human perspective at the moment, Mary is guilty of adultery. If he does not divorce her or marry her but instead exposes her to the Law, she—and hence the child she is carrying in her womb—will almost inevitably be stoned to death as her just punishment (Dt 22:21-24). This is important because Joseph’s “Yes” is not the “Yes” of justice under the Law; it is the “Yes” of righteousness, the choice of doing out of love—and contrary to his own interests—God’s mysterious and unfathomable will. This “Yes” of Joseph’s is the earthly father of Jesus saying, “Thy will be done, not mine,” thirty-three years before his son, also against His own earthly interests, would say the same thing. And the third, “Yes,” is God’s. God, “who is love (agapé),” must say “Yes” to becoming a human being, a member of a humanity long ravaged by and long subject to every manifestation of evil capable of expressing itself through the choices, including the choices of violence and enmity, of these same human beings. In Jesus, God, “who is love (agapé)” must be the human incarnation of that agapé—unconditional, nonviolent, self-sacrificing love for all, friends, strangers, and enemies alike. This Divine choice—to become incarnate as a human being in an environment in which legions upon legions of evil dynamics are operating within human beings and within the institutions they have erected, and to become human with only the power of love (agapé) available to confront and conquer these diabolical forces—is a choice that infinitely surpasses any understandings of justice and of reality. It is a Mystery that is beyond human fathoming because such a choice will inevitably result in a life of having to struggle to love, having to suffer to love, and having to die at the hands of other human beings to love—as God must and will always love on earth He loves in heaven. In the Mystery of the Annunciation, from the perspective of human beings in their spiritually fallen state, these three “Yes”es defy all notions of what is reasonable, even reason itself. Yet all three “Yes”es were freely given—and of what follows from these three gifts of “Yes,” we are all aware. We are told that, when Mary came into the physical presence of Elizabeth, “the babe in my womb [Elizabeth’s] leaped for joy.” (Lk 1: 41). 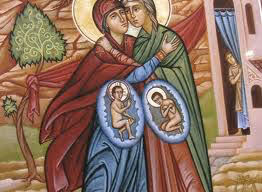 Again, the Visitation is a Mystery that underscores the profundity of the Christ-event from the earliest moments of God’s incarnation as Jesus of Nazareth. How does a child in the womb communicate anything to a child in another womb such that the second child would be moved to respond? And, not simply to respond, but to respond with such a superabundance of joy: “leaped.” The awe and joy of the presence of the glory of God, the Shekinah, experienced by John, a child in the womb of Elizabeth, who comes into the proximate physical presence of Jesus in the womb of Mary, points to a Mystery, not separated from but infinitely more wondrous than even the great mystery of a human life in the womb. It points to the daughter of Abraham, Mary, being The Ark of the Covenant, the complete fulfillment of everything the Ark was and represented in Hebrew Scriptures. Or, more precisely, Mary is the Ark of the New Covenant. The Ark of the Covenant was the sign of God’s real presence among His people. 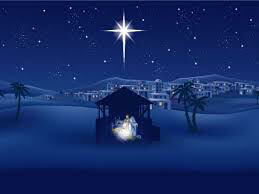 In Jesus the Christ, born of Mary, God was really present among his people in an even more direct way. The Ark of Hebrew Scriptures held the Word of God written in stone, the Ten Commandments. 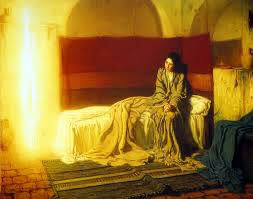 Mary bore the Word of God “made flesh” in her womb. The Ark of Hebrew Scriptures held the manna from heaven. Mary’s womb held the Bread of Life, Jesus Christ (Jn 6:48-50). Mary as the Ark of the Covenant, the New Covenant, in the Visitation is not an interpretation of the Gospel artificially place onto the Gospel. It is a truth presented by the New Testament writers themselves. “How can this be, since I have no relations with a man,” Mary at the Annunciation asks the Angel Gabriel regarding the birth of a son by her. Gabriel replies that it would happen by the power of God: “The Holy Spirit will come upon you, and the power of the Most High will overshadow you” (Lk 1:35). The Greek word translated “overshadow” is used nowhere else in the New Testament. In fact, it occurs only one other place in Scripture, if we refer to the Greek translation of the Old Testament, the Septuagint, which Luke was familiar with. The book of Exodus says Moses had the Ark of the Covenant placed in a great tent that was to serve as the dwelling-place of God among His people. It then reads, “Then the cloud covered the meeting tent, and the glory of the LORD filled the Dwelling. Moses could not enter the meeting tent, because the cloud settled down upon it and the glory of the LORD filled the Dwelling” (see Ex 40:34-35). In the Greek Old Testament, the one Luke knew, the word translated “settled down upon” in English is the same word that is translated into English as “overshadow” Luke is telling us that the presence of the power and glory of God, the Shekinah, will settle down upon, overshadowed, dwell in Mary just as the power of God overshadowed, settled down upon, the Ark of the Covenant and dwelt in the great tent. There is much more, e.g., when David finally is able to bring the Ark of the Covenant to Jerusalem, it says, “He leaped before it.” That is the same word in Greek as is used to described John’s actions in the womb of Elizabeth when she meets Mary is who now carrying Jesus in her womb. But the basic question that the Mystery of the Visitations and the symbolism of Mary as the Ark of the New Covenant in it present to the Christian, perhaps revolves around this thought. Wherever the ancient Israelites went, they followed the Ark of the Covenant. If Mary is the Ark of the New Covenant, how should we as Christians, people of the New Covenant, be following her? The answer to that questions is found in Mary’s last words and only command in the Gospels: “Do whatever He tells you“? The Baby Jesus—who is the Bread of Life for all humanity, and who, many years in the future at His Last Supper on earth will take bread into His hands and say to His Apostles and disciples, “Take, eat. This is my body”—is born in the little town of Bethlehem whose name in Hebrew, bet lehem, means “House of Bread.” He is laid in a manger from which animals derive their daily nourishment in order to live. What a Mystery: Born in a town called the House of Bread and dying loving His lethal enemies, so that He could be the Bread that nourishes human beings along the Way of becoming one with the Holy One, along the Way of Eternal Life. People can now freely choose to be and to become what they can now freely choose to consume, namely, the Bread of Life for the spiritual nourishment and sanctification of others and self. People can now receive the Bread from heaven that is offered to them in the Person, Words and Deeds of the Word of God Incarnate, Jesus, as well as when they receive the consecrated Bread at the re-presentation of the Last Supper, at the Holy Eucharist. What a Mystery! What had been exclusively the Bread of Angels in Eternity is, since the birth of Jesus the Christ in the House of Bread, now also the Bread of human beings in time. But God does not force His gift of the Bread of Eternal Life down any one’s throat. He simply daily offers it: “Take, eat.” And then promises, “Whoever eats of this Bread will live forever” (Jn 6:35-51). Can anyone doubt that the anguish that the mother of Jesus suffered as her Son was beaten, brutalized, tortured, tormented, and ultimately killed was anything less than monstrous and nightmarish? 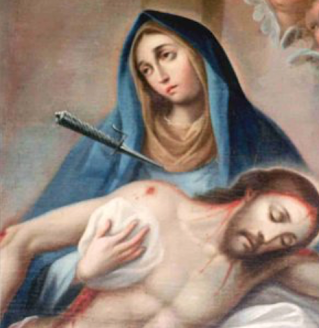 Can anyone doubt that, when the lance was thrust into the heart of Jesus, it also pierced the heart of His mother, bringing with it heartbreaking and mind-breaking pain and grief? 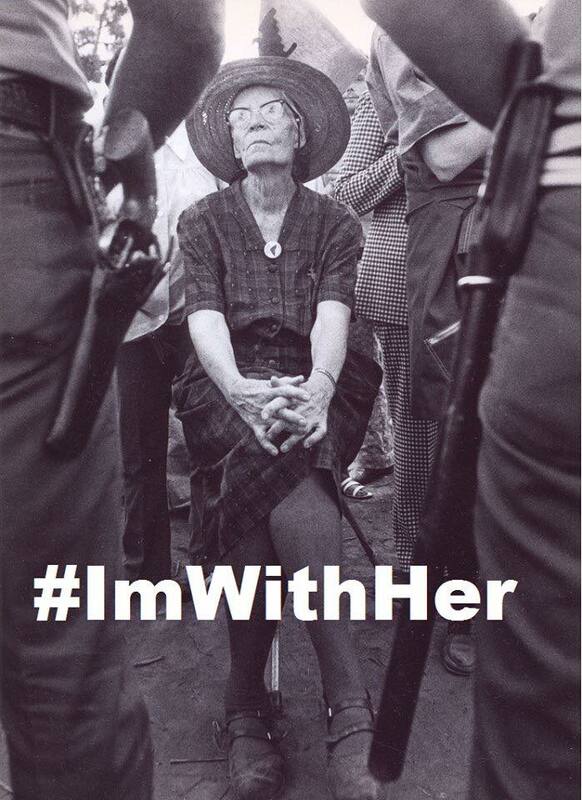 Can anyone doubt that such is the suffering of every mother and father, regardless of the age of their child, who sees or learns that their child has been torn apart in body, mind, and/or spirit by the violence and enmity, callousness, indifference and mercilessness of other human beings? What a Mystery that the Mother of Jesus, the Mother of the Christ, the Mother of God, the Mother of the Savior of humanity, has herself—like all other mothers and fathers whose precious children have been treated as worthless pieces of trash by other human beings—had to suffer the ravages of hell brought to earth through men and women in the service of the Satanic spirits of violence and enmity. As we mediate on Mary as a mother in sorrow, whose heart a “sword has pierced,” our thoughts and prayers and deeds should go toward all mothers who sorrowfully suffer because of what others have done to their precious child, whether he or she be five months oldest or fifty-five years old. There is an integral relationship between Mary having been a mother in sorrow on earth and Mary being the Mother of Mercy in heaven, whose Son performed His first miracle for a bride and groom at Cana because His mother in her empathy for their distress requested it of Him. 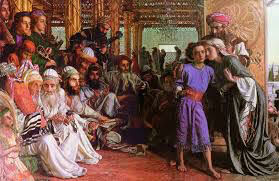 “When His parents saw him, they were astonished, and His mother said to Him, ‘Son, why have you done this to us? Your father and I have been searching for you sorrowfully’” (Lk 2:48). And so would it be with any mother and father who had lost their child in a department store crowd, at a ball game, or in a snowstorm; they would search for him or her sorrowfully. Mary and Joseph’s concern here is not for Jesus the Messiah, but for Jesus their beloved child. They dread that something awful might have happened to him. When one person loves another and that someone is hurt, the person who loves him or her is also hurt. It is not the same hurt, but it may be a more terrible hurt. Love generates empathy unlike any other experience in the human situation. This universally embedded truism is a piece of the Mysteries of Creation and of Redemption in which we live. It is therefore a fact of life that it is impossible to harm only one person. When you harm someone, all those who love the harmed person will also be harmed. When, for example, one kills another human being, one inflicts suffering and kills forever something in each and every person who loves that human being. It is only calculatingly nurtured, normalized superficiality that dupes people into thinking that the only person injured when they inflict harm upon another is the one on whom they are directly inflicting the harm. The experience of each and every one of us tells us that this is a lie. The sorrow and suffering that tears one person’s life to pieces, tears to shreds the lives and hearts of all who love him or her. Remembering this, and nurturing the habitus of mind that continually reinforces that remembrance is necessary for putting on the mind and heart needed for Christlike merciful love towards all, friends and enemies, great and small. Especially is this essential for living as Jesus desires His chosen disciples to live in a society where motivating and teaching children from the toddler stage onward how to play and enjoy making believe they are killing other human beings is a mainstream big and profitable business. 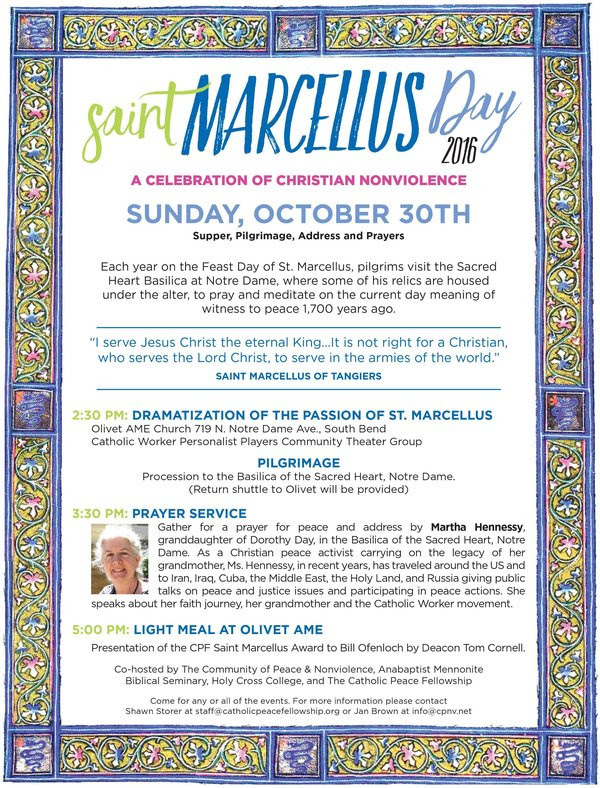 This entry was posted in Nonviolence, Pro Life, Saints and Soldiers and tagged nonviolence, rosary, the joyful mysteries on October 24, 2016 by Cammy. A chilling, Dr. Strangelovian nightmare plays out at a Titan II missile complex in Arkansas in September, 1980. A deadly accident – the result of a falling socket puncturing the fuel tank of an intercontinental ballistic missile carrying the most powerful nuclear warhead ever built by the United States – leads Air Force personnel, weapon designers, and first responders to work feverishly to prevent a calamitous explosion. Directed by Robert Kenner (Food, Inc.) and based on the critically-acclaimed book by Eric Schlosser (Fast Food Nation), COMMAND AND CONTROL is a minute-by-minute account of this long-hidden story – much of it based on recently declassified documents that expose other freak accidents and near-misses. 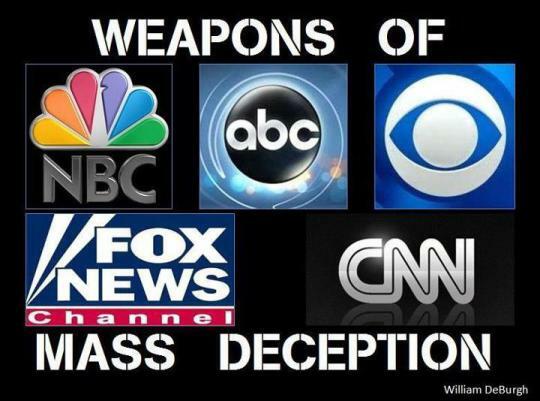 How do you manage weapons of mass destruction without being destroyed by them? This entry was posted in Documentaries and Film on October 24, 2016 by Cammy. This entry was posted in Uncategorized on October 20, 2016 by DB. ” ‘Nuclear arms offer a false sense of security and the uneasy peace promised by nuclear deterrence is a tragic illusion.” Archbishop Bernardito Auza, the apostolic nuncio heading the Holy See’s permanent observer mission to the United Nations, said Oct. 17. “Nuclear weapons cannot create a stable and secure world. Peace and international stability cannot be established on mutually assured destruction or on the threat of total annihilation. Lasting peace cannot be guaranteed by the maintenance of a balance of terror,” he added. Instead, peace must be based on justice, socio-economic development, freedom, human rights, and building trust between peoples, the archbishop told a session of the U.N. General Assembly in New York City. This entry was posted in Uncategorized on October 19, 2016 by DB.